Students practice asking and responding to questions about what they do on different holidays. A variety of verbs and vocabulary are used. Sample verbs are decorar, comer, ir, encender, marchar, cocinar, abrir, and tener. Students will practice 3 forms of each verb for asking, responding, and the follow-up written activity. 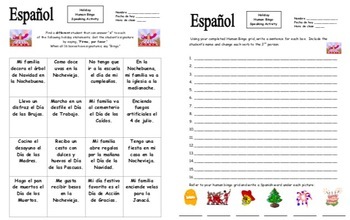 Each student mingles with a bingo grid and must find different classmates that can reply yes when asked about statements in each of the 16 boxes. A sample statement is, "Mi familia va al cementerio el Día de los Caídos." When a student replies yes to a question, the questioning student follows up by asking in Spanish for the student's signature. The goal is to be the first student to fill the entire bingo grid. 1. Write a sentence for each of the 16 boxes in the grid. The student includes the name of the student that signed the box and must change the verbs to the third person. 2. Write a Spanish holiday word under 6 images at the bottom of the paper. 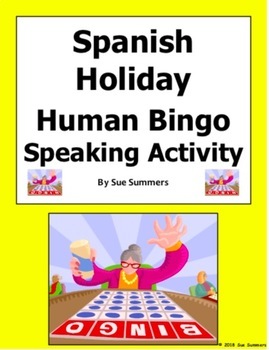 Please click here to see more of my Human Bingo activities. Please click here to see more of my Spanish speaking activities.